This week’s instalment of the #SBIDinspire series features the inspiring Belmond Andean Explorer. Muza Lab has exquisitely re-imagined the slow travel experience through their design of South America’s first luxury sleeper train, the Belmond Andean Explorer in Peru, which launched on the rails May 2017. Working closely with Belmond to compliment the brand’s heritage for properties that are at one with nature, the studio has harmoniously woven cultural connections with inspirations from the idyllic surroundings, creating a detailed backdrop for the breathtaking spectacle of the Peruvian Andes. SBID had the opportunity to speak with Inge Moore, Founder of Muza Lab. For South America’s first luxury sleeper train, Belmond Andean Explorer, Belmond gave us the brief to design a new, unparalleled level of experience that complements the brand’s heritage for properties that sit at one with nature. Our response was to create a one-of-a-kind immersion into Peru’s culture, landscape and crafts that gives passengers a contemporary, re-imagined way to enjoy the beauty of slow travel and create memories they will cherish forever. 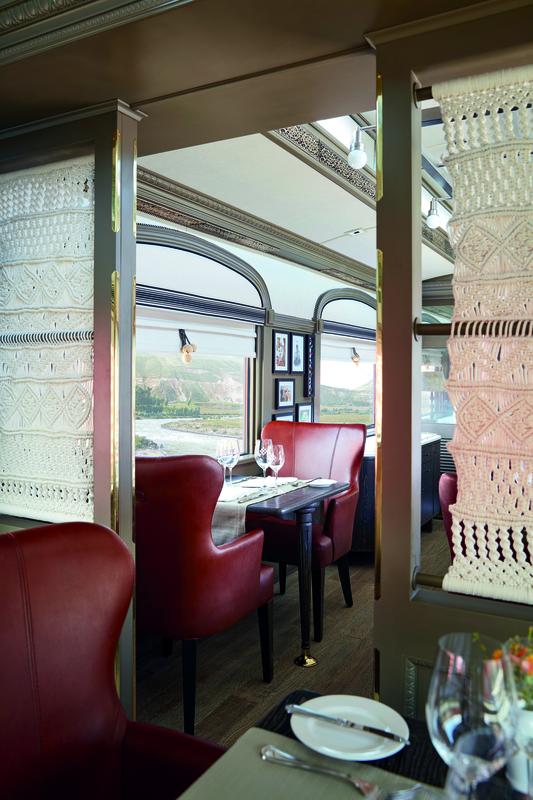 Our vision was to distil the romance, nostalgia and freedom of the train voyage through an interior design that taps into the journey’s dreamlike sense of suspended time, an experience where moments seem to slow down. We harmoniously wove cultural connections with inspirations from the surroundings to create a detailed backdrop for the breathtaking Andes mountains. Soft, neutral tones create an open, airy feel that allows the amazing vistas to take centre stage, while beautifully crafted furnishings reflect Peru’s heritage and natural bounty. Palettes, textures and patterns were chosen to create a sense of calm, a counterpoint to the vibrant panorama outside and a place of transition where travellers can ponder, dream and explore new horizons as the beauty of the land infuses their souls. In the Observation Car, guests can enjoy nearly 360-degree views, either leaning against the scrolled balcony rails or relaxing on the central round seat. Inside, the bar is furnished with traditional embossed leather chairs and cosy sofas. The elegant Piano Bar Car offers a more formal ambience with a corner bar at one end facing an impressive grand piano at the other, and a palette of refined grey tweed with splashes of cornflower blue and golden yellow. The spa is formed of three treatment rooms painted a soothing shade of white to inspire a sense of stillness and relaxation as the colourful landscape whirs past. Pale shades of taupe and cream enhance the two Dining Cars’ open spaciousness, and rich, cognac-toned leather chairs bring a substantial feel. One carriage also features a library as well as a boutique shop with original, handcrafted items from each destination along the route. Divider screens between seating groups have been refreshed with white macramé that replaces the inset timber panels. Carrying up to 48 passengers, the Sleeper Cabins have been designed with all the sumptuous amenities guests expect from a luxury experience. Select nostalgic elements of the original train have been restored or added as emblems of the golden age of train travel. Brass room keys were forged into the shape of the Chakana Cross, one of the most enduring shamanic symbols of Incan civilisation and the train’s official crest. There weren’t really any hurdles, but we did commit to creating a genuine, heartfelt experience of Peruvian culture versus a pastiche. Nearly everything has been locally sourced, supporting the local community while reducing the project’s carbon footprint. Finishes have been renewed where possible, and re-purposed materials contribute authenticity and environmental responsibility. For example, in the Observation Car, the round central seat is covered in fabrics from traditional dresses sourced by Muza at a Cusco market, and passementerie on the roman blinds is from antique Incan fabrics. The result is a welcoming spirit that feels real and honest. In addition, the design allows for furniture and accessories to be securely affixed due to the train’s movements. The Belmond Andean Explorer travels through one of Earth’s most beautiful countries, a destination on many people’s bucket-list of places to explore. To get an understanding of Peru’s culture, we visited several Belmond properties in Lima, Cusco and the Sacred Valley and researched its amazing landscape as well as the textiles and textures of Peruvian arts and crafts. It was a magical experience and, with so much beautiful inspiration, truly a designer’s dream project. The SBID International Design Awards elevate the stature of the interior design industry by highlighting exceptional talent, passion and expertise across the globe. Participating in the competition strengthens our reputation as imaginative leaders creating some of the world’s most exciting designs. Questions answered by Inge Moore, Founder of Muza Lab.